This scanner acquires large surfaces of non uniform color at high speed and gives precise color coordinates and the spectrum of each point. The SpectralScanner is an image spectrometer suitable for both industrial and scientific applications; it combines high image quality, compactness, and solidity at the very best price. It is available in different configurations (UV-VIS-NIR) and resolutions up to 700dpi. 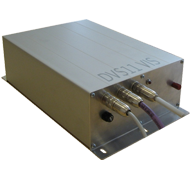 DV develops several fully automatic systems for industrial application using single and multi-point spectrometers. The spectral or colorimetric analysis on liquid and solid materials is performed continuously and the process parameters are monitored in real time. 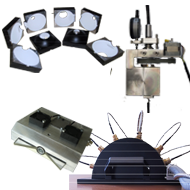 DV provides a wide range of probes for colour analysis or optimized for particular ranges (UV-VIS-NIR), for industrial and scientific purpose. 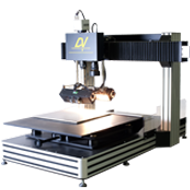 DV designs and manufactures them in order to meet virtually every need, i.e. the measure of liquids. Reflectance, absorbance, transmittance measures with specific geometries are performed according to the specific norms and CIE standards. 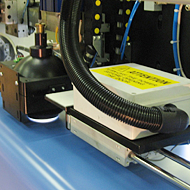 DV offers complete software solutions for colorimetry, device profiling, printing proof and for the channel separation required in printing process with engraved cylinders. 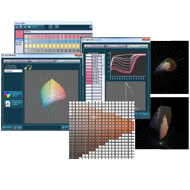 The software includes algorithms which construct and analyze the color spaces generated by a dyes set on a given substrate, then it calculates the amount of each colorant to reproduce a given color (color formulation).